In this breathless tale of bravery and battle, of white mans courage and red mans daring, Zane Grey has written one of his finest novels. 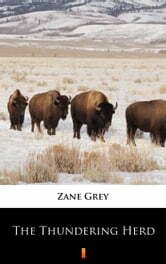 The great western writer’s story of the buffalo hunters, and the passing of the great herds of buffalo. „The Thundering Herd” is the story of the buffalo and of their near extinction when hide hunters swarmed the plains killing them by the tens of thousands, and at the same time helping to eliminate the Indians by killing their food supply. Grounded in the author’s sense of western history, it shows in no uncertain terms how white men were debased by the wanton destruction of the herds.